Prior to 2005, it was not known what teaching styles were used for physical education (PE) in the state of Queensland, Australia. 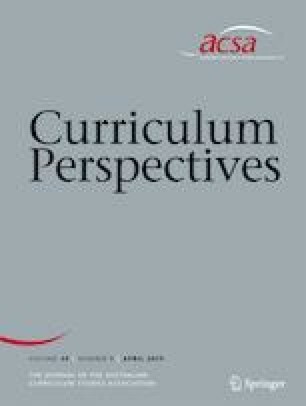 In order to explore the effect that teachers’ beliefs about teaching styles influenced their self-reported use, Cothran et al. (Research Quarterly for Exercise and Sport, 76(2), 193–201, 2005) conducted a study in which teachers were asked to complete a questionnaire that presented various teaching style scenarios based on the 11 styles identified by Mosston and Ashworth (2008). This research included Queensland teachers of both primary and secondary PE, but did not confirm through observation the accuracy of the self-reporting. To address this gap, this paper presents the findings of observations of teaching styles used by nine teachers of Queensland senior PE across three 1-h lessons of a 9-week unit, to determine whether syllabus outcomes were being met. The teachers had all completed 4-year training, with three having 0–4 years of teaching experience, three with 5–10 years, and three with 11 years or more. The nine participants’ lessons (n = 27 lessons) were coded by two coders using Ashworth’s (2004) Identification of Classroom Teaching-learning Styles and descriptors of teaching styles from (Cothran et al. 2005) Teaching Physical Education (Mosston and Ashworth 2002). Inter-observer reliability over the 27 lessons was 99%. The data were analysed via an SPSS version 21 command to determine the means and frequency distribution of the styles indicated within the Mosston and Ashworth (2008) Spectrum. The senior PE teachers participating in this study failed to demonstrate the use of a range of styles in their lessons, in spite of the Queensland Senior Physical Education Syllabus (2004) detailing a specific range of styles to be used. This suggests that the aims, objectives and outcomes (including higher-order thinking skills) as described in the syllabus were not being met. The authors received no financial support for the research, authorship, or publication of this article.